What's in a name? From the Latin word for sky blue, caesius. Say what? Cesium is pronounced as SEE-zee-em. Cesium was discovered by Robert Wilhelm Bunsen and Gustav Robert Kirchhoff, German chemists, in 1860 through the spectroscopic analysis of Durkheim mineral water. They named cesium after the blue lines they observed in its spectrum. Today, cesium is primarily obtained from the mineral pollucite (CsAlSi2O6). Obtaining pure cesium is difficult since cesium ores are frequently contaminated with rubidium, an element that is chemically similar to cesium. To obtain pure cesium, cesium and rubidium ores are crushed and heated with sodium metal to 650°C, forming an alloy that can then be separated with a process known as fractional distillation. Metallic cesium is too reactive to easily handle and is usually sold in the form of cesium azide (CsN3). Cesium is recovered from cesium azide by heating it. Cesium has the second lowest melting point of all metallic elements, which limits its uses. Cesium readily combines with oxygen and is used as a getter, a material that combines with and removes trace gases from vacuum tubes. Cesium is also used in atomic clocks, in photoelectric cells and as a catalyst in the hydrogenation of certain organic compounds. 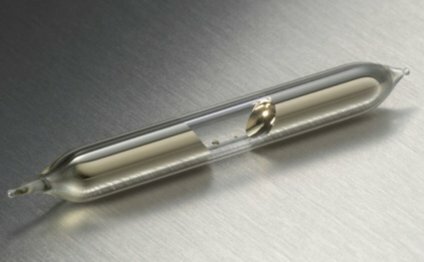 Since it is easily ionized and has a high mass, cesium ions may one day be used as a propellant in ion engines on spacecraft. Cesium reacts violently with water and ice, forming cesium hydroxide (CsOH). Cesium hydroxide is the strongest base known and will attack glass. Cesium chloride (CsCl) and cesium nitrate (CsNO3) are cesium's most common compounds and are primarily used in the production of other chemicals.